Sounds intriguing, right? Your probably wondering what could be fashionable in a hospital. Most of the things you see are plain especially in colors. Well, minus that pediatric ward and the nursery room. Doctors and nurses could improve their clothing like changing the color but that will look unprofessional to the eyes of the patients. Then what could be something that can be change to lessen the dread feeling if in case you'll be confined in the four corners of a white room? Three sisters namely Peg, Patty and Claire created designs to change the look of the dress/gowns that the patients used when they are in the hospital. One of them is a versatile hospital gown that is simple and tailored-fit to use for laboratory exams and treatment. 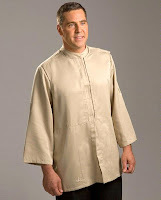 Another style is a relaxed hospital gown that can be worn by male and female. It is a loose fit and comfortable which is ideal for nursing moms. Apart from the hospital robe, they also have pants and a much longer hospital gown. All of their products come in different colors so no need to worry in being plain as the walls on your hospital room. In this way, it will lessen the sickness feeling of the patients and makes them livelier. Nobody will even notice that you're wearing a hospital dress/robe if you used this outside. It looks trendy and chic. The fabric used for the products are extremely soft providing easiness to those who will wear it. I'd say, fashion is for everyone. Even if you're sick you're not oblige to look like one especially if you're wearing one of these hospital robes/gowns.